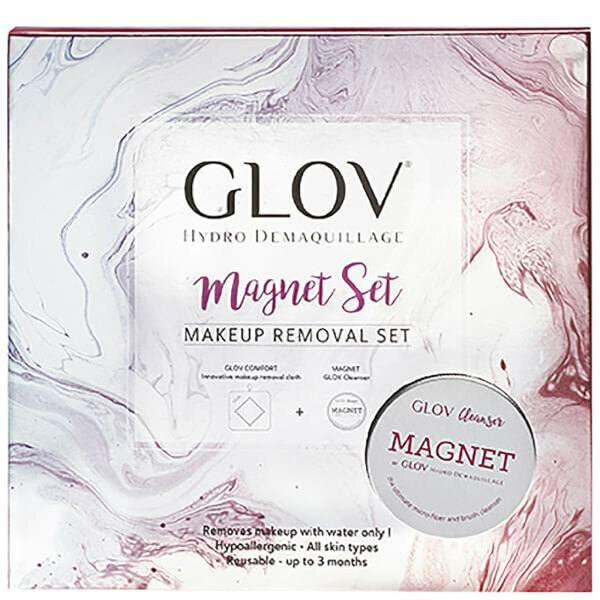 The GLOV Hydro Cleansing Magnet Set is an effortless, efficient and simple way to cleanse skin without the need for a cleanser, perfect for everyday pampering. Presented in branded gift packaging, the kit provides an innovative solution to leave skin feeling refreshed and purified. The Comfort Hydro Cleanser is an effortless, efficient and simple way to cleanse skin without the need for a cleanser, ideal for removing stubborn and heavy makeup in difficult-to-reach areas. Utilising advanced microtechnology, the ‘heavy duty’ cleansing glove contains refined fibres up to 30 times thinner than a cotton pad, which boast electrostatic properties to absorb makeup, dirt and excess oil like a magnet. The larger, square shaped design is perfect for the eye contour and covering larger surface area across the neck and décolletage. 1 x Magnet Cleanser Soap - to powerfully clean the GLOV after each use for optimum efficiency and lifespan. 1 x Travel Hanger - with suction cup to hang the GLOV up after each use. Hang it for fast and easy drying.